Researchers at Northwestern University say that a single 2-3 hour exposure therapy session helped 12 study subjects overcome debilitating spider phobias for good. 12 subjects volunteered to participate in an exposure therapy study to try to overcome spider phobia, also known as arachnophobia. All subjects experienced debilitating spider anxiety that affected normal functioning, such as not being able to walk in deep grass for fear of spiders or being unable to enter a house for some days after seeing a spider within. For a baseline reading, researchers used MRI scans to observe areas of the brain associated with fear while presenting subjects with images of spiders. Each subject then individually participated in a 2 to 3 hour exposure therapy session, which involved learning more about the true nature of spiders and confronting some of their irrational fears. 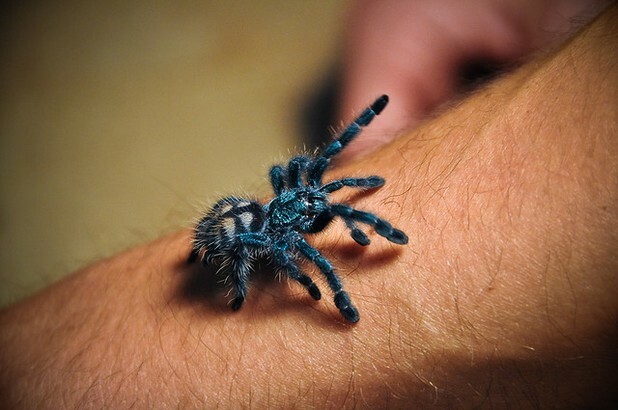 While at the onset of the session many participants could not get within 10 feet of a tarantula housed in a glass aquarium, by the end of a session of gradually increasing exposure, the subjects were holding and petting the tarantula in their bare hands. MRI scans done immediately after the session and again 6 months later demonstrated a substantial and lasting reduction in neural fear response upon the viewing of images of spiders. Approximately 7% of Americans have specific phobia. The researchers say that the study shows how well exposure therapy works to help people overcome an irrational fear of spiders and say that exposure therapy likely works equally well to help people overcome other types of irrational fears, such as a fear of other types of animals or of flying. Learn why avoiding what causes your anxiety isn’t a very good strategy and learn what steps you can take to break out of a negative cycle of social anxiety. Anxiety in a dangerous situation is healthy; anxiety in a safe situation is not. A phobia is an unreasonable fear that can reduce quality of life. Phobias are very treatable but very few people with specific phobia get help.